Barrie Colts at NHL Development Camps. - Very Barrie Colts | A website covering the Barrie Colts of the OHL. Home blog Camp. NHL OHL Barrie Colts at NHL Development Camps. Barrie Colts at NHL Development Camps. NHL season is not far away. With teams starting their Development Camps we realize that the season is very close! There are 8 Barrie Colts who are hoping to impress these camps and are hopeful to crack the roster. Here is a list of the players who are taking part in these camps which are held over 5 days. 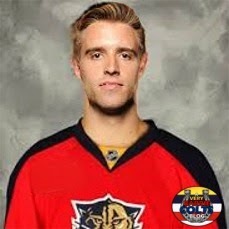 Aaron Ekblad who was drafted first overall in this years NHL draft is taking part in the Florida Panthers camp which is being held July 7th - 11th. Brendan Lemieux who was drafted 31st overall in the 2nd round of this years NHL draft is taking part in the Buffalo Sabres camp which is being held July 14th - 18th. Kevin Labanc who was drafted 171st overall in the 6th round of this years NHL draft is taking part in the San Jose Sharks camp which is being held July 7th - 11th. Andreas Athanasiou who was drafted 110th overall in the 4th round at the 2012 NHL draft is taking part in the Detroit Red Wings camp which is being held July 4th - 8th. Jake Dotchin who was drafted 161st overall in the 6th round at the 2012 NHL draft is taking part in the Tampa Bay Lightning camp which is being held July 2nd - 6th. Andrew Mangiapane who was invited by the Arizona Coyotes as a free agent. Camp is being held from July 7th - 11th. Cordell James who was invited by the Vancouver Canucks as a free agent. Camp is being held from July 7th - 11th. Joseph Blandisi who was invited by the Winnipeg Jets as a free agent. Camp is being held on July 2nd - 6th.